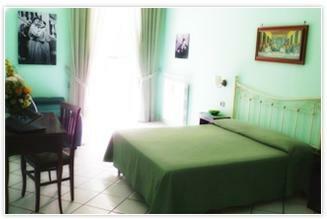 Terra Mia B&B Naples. Bed and Breakfast Terra Mia, Naples. The Bed & Breakfast Terra Mia represents a pleasant discovery among the big hotel offer of the city: simple, modern, welcoming and refined structure that draws inspiration from the tradition of Neapolitan song and from one of its main singer: Pino Daniele. The hotel is characterized by his personality, from the spacious rooms that are named after his most beautiful songs "Napule è", "Passi d'Autore", "Tra Musica e Magia". Moreover, the hotel devotes itself to the other singers and actors that have showed Naples and its history, tradition, culture and art all around the world. Refined and accurate welcome guaranteed by a qualified staff always at your disposal, with a particular attention to the details, where everything was chosen with attention; in order to exalt the traditional Neapolitan hospitality and give you at the same time the best comforts. All the rooms can be transformed, according to your needs, in triple or quadruple rooms. All the rooms offer bathroom, as well as the amenities of a traditional hotel, like: air conditioning, satellite TV, direct telephone line. Moreover, you have at your disposal laundry service, strongbox service and a cosy parking at 100 meters. Easily reachable by car, underground, train or bus, the B&B is located close to the National Archaeological Museum of Naples, in the heart of the city, near all its main touristic attractions. In the morning start your day with the right energy: an abundant buffet breakfast is the right choice, where you can find several kind of products in order to satisfy our international clientele. A lively but private character, qualified staff and the central situation will make your stay at the B&B Terra Mia a unique experience, where you can enjoy Naples and its tradition…starting from its music!